A one-stop shop to tackle the ever-increasing threat of malware on OS X. When it comes to malware, Mac users have become somewhat spoiled, historically having little to fear from those nasty Trojan horses, spyware, and other malfeasants that create frequent headaches on Microsoft’s desktop operating system. But malware attacks are on the rise and OS X is no longer immune to such threats. According to a study from Bit9 and Carbon Black, 2015 was a banner year for malware on the Mac, with more than 1,400 unique samples collected and analyzed, a whopping five-fold increase over the previous five years combined. Whether targeting Java vulnerabilities, email, or just annoying users with adware, hackers are taking aim at a new generation of Mac users. It’s time for Apple fans to fight back and fortify their systems by combating these nuisances head-on, before they have a chance to do any damage. 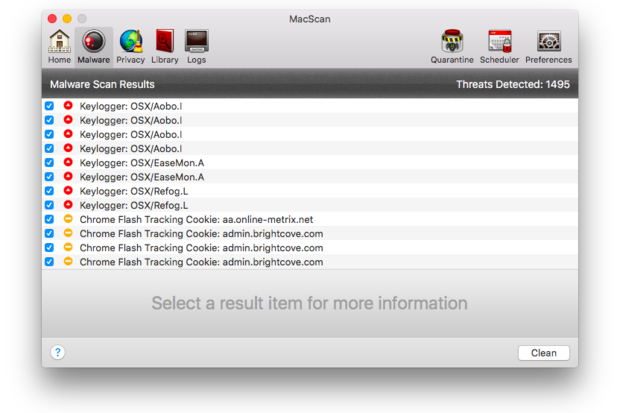 Malware and tracking cookies can again be a thing of the past, thanks to the easy-to-use MacScan 3. 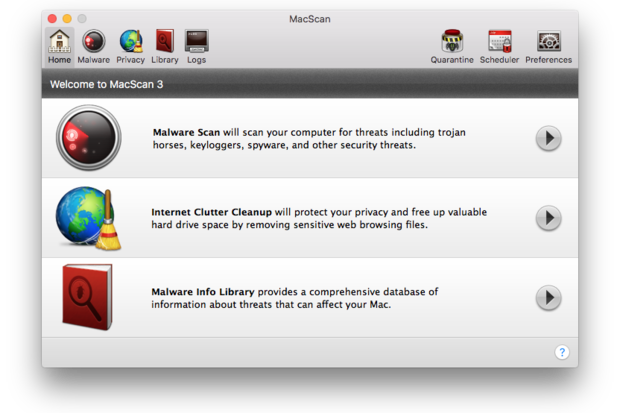 MacScan 3 has been designed to quickly identify and eradicate malware, spyware, Trojan horses, and tracking cookies from your system. Rewritten from the ground up for OS X 10.8 Mountain Lion and later, the software is well organized and simple to use. Malware Scan and Internet Clutter Cleanup options are grouped together on the home screen, along with with a comprehensive, up-to-the-minute library of known malware threats. 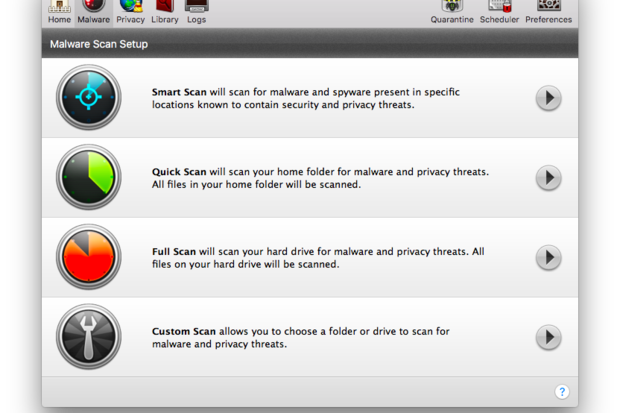 Malware Scan offers four different options for scanning your system, depending upon how much time you want to devote to the process. The first is the new, faster Smart Scan engine, which goes to work in specific areas where security and privacy threats are known to hang out—a process that took about an hour on my mid-2012 MacBook Pro with Retina display. Any rogue malware discovered is first quarantined, offering users a chance to examine files prior to removing them. Because one size doesn’t fit all, MacScan 3 offers four different scanning methods, including the new, faster Smart Scan. If you want to be less thorough, Quick Scan limits its scope to the user’s Home folder, which reduces the scan time to under ten minutes. As the name implies, a Full Scan scours every inch of your hard drive, while Custom searches only specific files or folders of your choosing, which can also be dragged and dropped from the Finder. It’s worth noting MacScan taxes the processor while scans are in progress, often consuming more than 60 percent of available CPU. The Malware Info Library provides an exhaustive catalog of threats with the most serious offenders highlighted in bold. Click one and you’ll be presented with all known up-to-the-minute information about the selected topic, or users can jump directly to another by entering its name directly into the search field. Following a scan, MacScan 3 displays a list of all malware and tracking cookies discovered, with the option to eliminate them in one click. 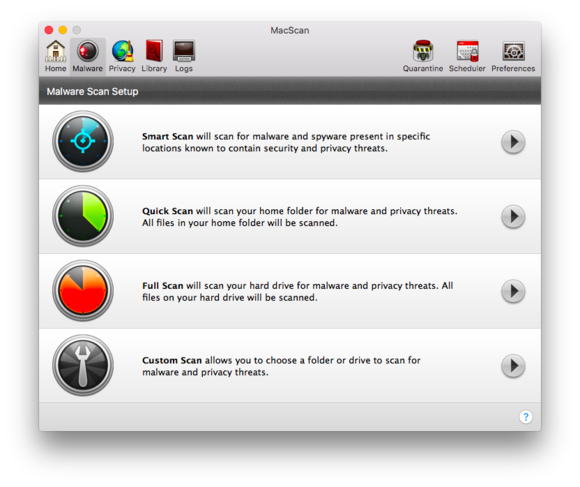 During testing for this review, I’m happy to report MacScan 3 found no malware on my system, although the software did turn up another scoundrel lurking just below the surface. Tracking cookies are harmless little bits of text advertisers leave behind when you visit a website. They’re not really a threat, but because they can be used to identify users (and in many cases customize web pages upon subsequent visits), privacy advocates consider them sinister enough to eradicate when possible. 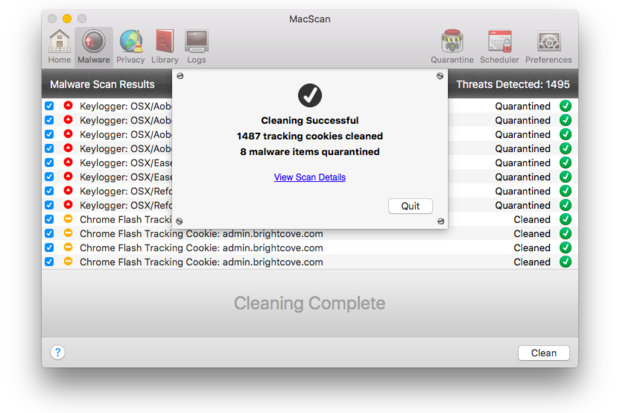 Browsers like Safari can be set up to block cookies entirely, but removing existing ones is a job for MacScan’s Internet Clutter Cleanup mode. Cookie Scan performs this task in a matter of seconds by limiting its search to known blacklisted tracking and Flash cookies. Like the malware section, there’s also Full and Custom scan options, should you want to dig deeper into cache files or browsing and download history as well. Because we’ve all got enough on our minds, MacScan 3 allows users to schedule individual Smart, Quick, Full, or Cookie scans for a specific time on each weekday, weekend, or day of the week that’s convenient for you. When not running, the software lives in the menu bar for quick access to scans, schedules, and activity logs. There’s really only one potential downside, and that’s the price: $50, which protects a single computer for one year. Considering SecureMac constantly (and automatically) updates malware definition and tracking cookie blacklists, it’s a fair price. The company also offers a free 30-day trial version from its website, along with a good discount on multi-year, multi-user licensing. You’ll have to quit out of MacScan 3 after each scan and cleaning is completed. 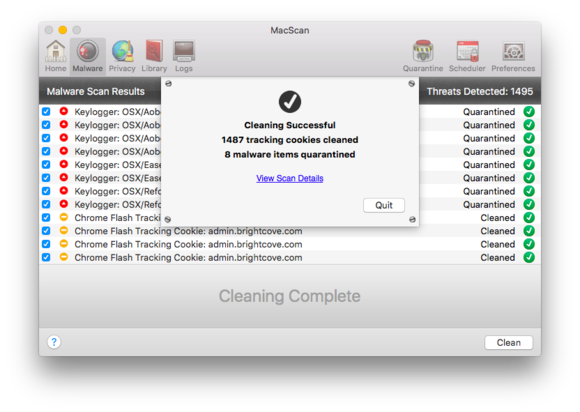 MacScan 3 makes rooting out and eradicating malware or tracking cookies as easy as a few clicks of the mouse, but you’ll need to pay for more than one year at a time if you want the best deal. 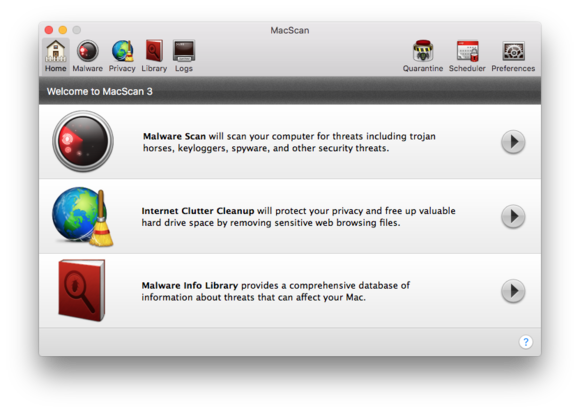 Whether it’s a Trojan horse, spyware, or blacklisted tracking cookies, MacScan 3 is a one-stop shop to tackle the ever-increasing threat of malware on OS X.